By Mary Shomon – Reviewed by a board-certified physician. As part of the ongoing coverage of the pros and cons of chiropractic approaches to diagnosis and treatment of hypothyroidism and autoimmune thyroid disease, we have an opportunity to do a Q&A with Dr. Datis Kharrazian, DHSc, DC, MNeuroSci.Dr. Kharrazian is a chiropractic practitioner with expertise in nutrition and neurology. He is author of the book, “Why Do I Still Have Thyroid Symptoms When My Lab Tests Are Normal? ” which details the nutrition-based approach that Dr. Kharrazian has developed to address Hashimoto’s and hypothyroidism, and which he disseminates to chiropractors and other healthcare providers via workshops and educational seminars. Mary Shomon: Since chiropractic care is known for the focus on spinal issues and back pain, how has the thyroid — an endocrine gland that is usually not primarily involved in spinal or back conditions -– become a focus for chiropractic care? Dr. Kharrazian: Many patients with hypothyroidism suffer from a long list of musculoskeletal complaints, such as carpal tunnel syndrome, autoimmune joint diseases (arthritis or joint degeneration), poor recovery from muscle injury, inflammation, headaches, back pain caused by obesity, and other issues that lead them to seek the care of a chiropractor. Since many patients don’t realize these symptoms are caused by hypothyroidism, it is not uncommon for a chiropractor to run lab work and identify the underlying problem. Many of these patients have been to one or more primary care physicians who failed to diagnose their hypothyroidism. The licensed doctor of chiropractic is not trained in just spinal manipulation, but also in proper differential diagnosis. Differential diagnosis is the process in which the presenting problem is examined in terms of underlying causes and related health issues. Chiropractic education is primarily focused on basic anatomy, physiology, histology, pathology, physical examination, radiology, and laboratory diagnosis. Mary Shomon: Can you explain a bit more about the education chiropractors receive, and how, from your perspective, it differs from the education received by medical doctors (MD)? Dr. Kharrazian: The doctor of chiropractic (DC) degree is equal in hours to the doctor of medicine (MD) degree, with almost identical programs the first two years. The programs diverge, however, in the second half. During this time, the DC program focuses on diet, nutrition, and spinal manipulation, while the MD program emphasizes the study of pharmacology. Chiropractors are licensed in every major state in the United States as a primary healthcare provider, and their education as doctors is approved and recognized by the United States Department of Education, as well as every major state regulatory body. Chiropractors have both professional and legal responsibilities to properly diagnose their patients. Doctors of chiropractic are trained to diagnose conditions such as hypothyroidism through the use of patient history, a physical examination, laboratory tests, imaging studies, electrodiagnostic studies, and more. Mary Shomon: Some people have the idea that chiropractors are using spinal manipulation to treat hypothyroidism. Is that true? Dr. Kharrazian: All chiropractors understand that the proper management and treatment for hypothyroidism is thyroid hormone replacement, and if a chiropractor identifies hypothyroidism, he or she refers the patient to a medical doctor for proper treatment. The notion that a chiropractor will attempt to treat hypothyroidism by performing spinal manipulation or by taking a patient off of replacement therapy is misguided and naive. The chiropractic community would not tolerate such actions, and the chiropractor would face severe legal consequences and potential disciplinary action, such as revocation of his or her license by state chiropractic board. As a chiropractor who is involved in chiropractic education, consultation for state board complaints, and medical-legal issues, I have never heard of a chiropractor attempting to use spinal manipulation to correct a thyroid problem. It is just not happening. Mary Shomon: In your opinion, how can chiropractic care support those with hypothyroidism? What potential role is there for a chiropractor when it comes to diagnosing and treating patients with thyroid conditions? Dr. Kharrazian: The answer is simple — to provide guidance in a healthy lifestyle, sound nutrition, and a good diet. The goal is not to cure or treat the condition. In fact, in my book, I state several times that Hashimoto’s hypothyroiditis, an autoimmune thyroid condition that accounts for about 90 percent of cases of hypothyroidism in the United States, cannot be cured but instead, tamed or put into remission with dietary and lifestyle adjustments. These changes can greatly improve function and quality of life. More importantly, they can prevent future autoimmune diseases from developing. Lifestyle, nutrition, and diet are areas of extreme importance for patients suffering from thyroid conditions, and they are areas that go unaddressed by the average medical doctor. That most people develop hypothyroidism as result of autoimmune Hashimoto’s thyroiditis is easily confirmed by thyroid antibody blood tests. However, in the standard health care model, these antibodies typically are not tested because the results do not affect treatment. Whether test results are positive or negative, treatment will always be thyroid hormone replacement. Management of hypothyroidism consists solely of making up for the loss of thyroid hormones due to autoimmune destruction of the thyroid gland. It is a very narrow and linear model that does not account for the mechanisms of autoimmunity itself. What this model fails to address is that patients who suffer from Hashimoto’s thyroiditis and autoimmunity in general have related issues, such as gluten sensitivity, vitamin D imbalances, blood sugar instability, intestinal permeability, and so on. These other issues are not diseases but instead are alterations in physiology that can profoundly impact patients’ health and quality of life. Consultation with practitioners trained to provide dietary, nutritional, and lifestyle guidance, such as doctors of chiropractic, can result in significant and meaningful health improvements. Despite the evidence in the scientific literature that these related health issues exist in the autoimmune thyroid population, the standard health care model rarely addresses them. Instead, the focus is on thyroid hormone replacement and using thyroid-stimulating hormone (TSH) as the exclusive marker for the patient’s entire spectrum of health. Patients with hypothyroidism need proper management of hypothyroidism with hormone replacement, but they also need complementary changes in their diet, nutritional status, and lifestyle to support a better quality of life. Many doctors of chiropractic and other health care practitioners with similar education and qualifications have helped fill the void created by isolated thyroid replacement and TSH-only measurements. Mary Shomon: You discuss the need for thyroid hormone replacement medication as part of the treatment protocol. Since chiropractors are unable to prescribe thyroid medication, if a chiropractor is the one who initially identifies a thyroid condition, how does that work for the patient? Do some chiropractors attempt to treat using nutritional supplements before referring a patient to a medical doctor? Ideally, how would a chiropractor and a medical doctor work together to manage a patient’s hypothyroidism? Dr. Kharrazian: When TSH is out of lab range, the chiropractor is legally and professionally obligated to refer the patient to a medical doctor. Some will refer to the patient to his or her primary care physician. Others have established good working relationships with medical doctors who understand and are open to integrative models. However, it’s important to emphasize that thyroid hormone medication is only one part of the care that may be required to improve the quality of life of an autoimmune thyroid patient. Unfortunately ,only a small percentage of thyroid patients feel back to normal after thyroid hormones alone, and most medical doctors have no training in nutrition, do not subscribe to scientific nutritional journals, or keep up with research outside of pharmacology. Many times what you’ll see is the patient who decides to create his or her own team to address both conventional and alternative approaches. It has been staggering the number of stories of we have received via email from patients whose medical doctors disregard their complaints once TSH is normalized with thyroid hormones. They still feel awful and have symptoms, but are told to quit complaining, to start exercising more, to get a hobby, or to take antidepressants. Many patients have been to numerous doctors, others have gone to nationally renowned medical clinics, and yet their symptoms continue to deteriorate over the years. This is essentially what drove my own work in hypothyroidism — eventually some of them land in my office with numerous autoimmune conditions and an overall deteriorated state of physical and neurological health. I realized I couldn’t begin to unravel everything until I understood how to address the thyroid and autoimmune disease. The best-case scenario is to catch it early and address it before the patient has to go down that road. Mary Shomon: You talk about chiropractic diagnosis and treatment for Hashimoto’s and hypothyroidism, but what is your position on patients who have active Graves’ disease/hyperthyroidism? Dr. Kharrazian:Graves’ disease patients are at major risk for a thyrotoxicosis leading to stroke and need to be managed by a qualified medical doctor pharmaceutically to dampen their overactive thyroid condition. 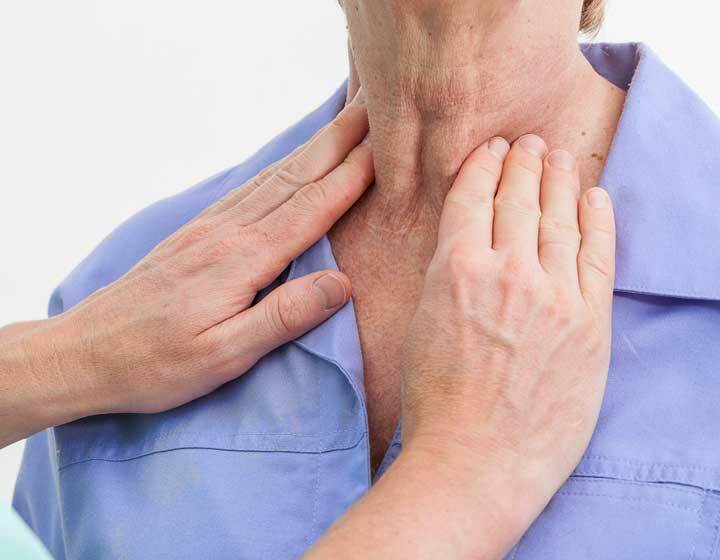 Although hyperthyroidism is not nearly as common as hypothyroidism, these cases do pop up in chiropractic offices all the time with a long list of complaints such as muscle spasms, carpal tunnel syndrome, vertigo, migraines, etc. In my experience, most of the ones I have diagnosed had already visited their medical physicians and were given the diagnosis of generalized anxiety disorder and treated with sedative medications such as benzodiazepines (Xanax, Klonopin, Paxil, etc). It is common for them to be overlooked in the standard five-minute medical visit. Once a patient with Graves’ is managed by pharmacology to dampen the overactive thyroid condition, she is no different than any other patient suffering from an autoimmune disease in regard for the need to address diet, nutrition, and lifestyle. Mary Shomon: One of the issues that you discuss in your book, and that is part of your approach, is the use of –- or avoidance of -– iodine supplementation. As you know, this is a controversial issue, and some physicians and practitioners believe that iodine deficiency is a major contributing factor to thyroid issues, and recommend high-dose iodine supplementation for most thyroid patients. You have been much more cautious about iodine in your approach. Can you explain a bit more about your thoughts on this? Dr. Kharrazian: There are many outdated concepts regarding the thyroid, such as the use of basal temperature, goitrogenic foods, thyroid glandulars, etc. Most nutritionists and natural-minded doctors assume hypothyroidism is caused by a nutritional deficiency and it is not. For most patients, it is an autoimmune condition, and very few people understand autoimmune mechanics and therefore use practices that are ineffective or contraindicated. The use of iodine is absolutely contraindicated for Hashimoto’s patients. The use of iodine may promote the autoimmune attack generated by thyroid peroxidase (TPO) antibodies and reactive oxygen species. I have compiled a small list of scientific abstracts on my web page. I strongly urge all thyroid patients to share the research with everyone. The use of iodine is one of the biggest mistakes by thyroid patients and practitioners who nutritionally support patients with thyroid conditions. I hope the word gets out soon. I have been screaming it from the top of my lungs for the past 10 years and nobody is listening. Mary Shomon: As you know, there have been some serious concerns in the thyroid community regarding what are viewed as exorbitant fees being charged, and up-front financial commitments being required by some chiropractors who are promoting their treatment of Hashimoto’s and hypothyroidism. Do you have any thoughts about this? Dr. Kharrazian: Health insurance typically only reimburses for thyroid hormone replacement and occasional TSH measurements — the model that has been defined as the standard. They may not reimburse for laboratory tests that evaluate vitamin D imbalances, gluten sensitivity, intestinal permeability, immune imbalances, and more. They also do not typically reimburse for dietary, nutritional, and lifestyle consulting, as well as nutritional compounds and supplements. Unfortunately, both alternative health care providers and complementary-based medical doctors are forced to charge cash for such tests and services. This means that hypothyroid patients wanting holistic care may need to invest money outside of their current medical insurance for such services. Functional laboratory tests, dietary supplements, and lifestyle consulting can become expensive very quickly. There is no uniform method of structuring the business end of a health care practice. Prices can vary significantly and a higher price does not necessarily ensure a more qualified practitioner, and vice versa. I do not teach or endorse business methods of any kind, and I urge patients to shop around critically. Ask questions, ask for referrals, compare costs, use your common sense, and trust your intuition, just as you would when shopping for a contractor, a car, or even a house. It is always a red flag for a patient if they are being pressured into any program by sell or fear tactics. A clear understanding of fees and services should always be presented to the patient without pressure or gimmicks. Ultimately, the patient and the healthcare provider must develop a relationship of trust if they are going to work with each other in a productive and healthy way. You will be creating a relationship with your practitioner and want not only someone who is qualified but also someone with whom you feel comfortable. Trust is a vital ingredient in the patient-doctor relationship. It will help your compliance as you make challenging transitions into dietary and lifestyle changes, and it will help you feel positive about your health journey. For patients who are accustomed to their insurance paying for all health care (sadly a shrinking minority), the idea of self-pay can be difficult to swallow at first. Many patients do not see all of the expenses that health care practitioners must cover: office space, equipment, staff salaries, student loans, malpractice insurance, continuing education classes, and so on. Although some practitioners have turned their practices into cash offices, most work for an hourly fee just as any independent contractor. Although the cost can be high, people who worked with a qualified practitioner whose fee structure they found acceptable say their return on investment was more than worth it. For many people in today’s economy, paying cash for care is not possible. This is a heartbreaking problem for which I do not have an answer, and it reflects the larger problem of a broken health care system that does not always practice evidence-based medicine and is frequently governed by the health insurance industry. This is more than any one individual can tackle, and the best I can offer is to contribute to the field of thyroid management and hope that some of the holistic-care principles described above eventually make their way into the standard health care model. Also, for those people who can’t afford care, I cannot emphasize enough the importance of your diet. I have outlined in the book how to get started and you will find more advanced diet information on my blog. One practitioner who has been to my seminars worked with a young woman in Romania whose Hashimoto’s had gotten so bad she had to reduce her hours at work. She wasn’t able to get any supplements through customs or have any lab work done. She was, however, able to get cod liver oil locally and make changes to her diet. Just these two things alone restored her energy and health. I know not everyone is this lucky as some have more persistent and severe issues, but it is where you start regardless, and you don’t need a practitioner to do it. Mary Shomon: Can you tell us a bit more about your book, and why you wrote it? Dr. Kharrazian: As a chiropractor, I cannot tell you how many patients suffering from thyroid problems have improved their health when they learned about diet, nutrition, and lifestyle. Just the basics of proper gluten sensitivity testing and helping patients transition to a gluten-free diet have helped countless people. Many even find out that supplements they take daily actually promote Hashimoto’s thyroiditis. I have tried to create a resource for hypothyroid patients with my book “Why Do I Still Have Thyroid Symptoms When My Lab Tests Are Normal?” I have referenced more than 600 peer-reviewed scientific papers in the book to ensure it is clear that the nutritional and lifestyle approaches described are based on evidence. I have received many thank you letters and testimonials since the book’s release from people all over the world who are on thyroid replacement and have used the book to address related issues that impacted their quality of life. These more comprehensive issues may not be addressed by practitioners who only use thyroid hormone replacement or even by many integrative MDs who have only rudimentary training in nutrition, diet, and lifestyle. Qualified doctors of chiropractic and other qualified alternative medicine practitioners use evidence-based nutrition and laboratory analysis to help fill the void created by the standard health care model, thus optimizing the quality of life for many thyroid patients. Ultimately, the thyroid patient must decide which model works best for him or her and hopefully can create a team of health care providers to address the spectrum of issues associated with hypothyroidism and Hashimoto’s thyroiditis. Datis Kharrazian, DC, DHSc, MS, MNeuroSci, FACFN, FABVR, FAACP is a Doctor of Chiropractic, has a Master of Science degree in Human Nutrition, a Master of Neurological Sciences, and a Doctor of Health Science from Nova Southeastern University. He is a professor of neuroendocrinology for the Carrick Institute of Graduate Studies and a Fellow of the American Academy of Chiropractic Physicians, and Fellow of the American College of Functional Neurology. He is author of the book Why Do I Still Have Thyroid Symptoms? When My Lab Tests Are Normal: A Revolutionary Breakthrough In Understanding Hashimoto’s Disease and Hypothyroidism.